Watch this video to get a sneak peek into our daily routine. Thompson Suburban Dental Laboratory is a full-service Maryland dental lab located in Timonium, MD. Our cosmetic dentistry services range from implants and provisionals to fixed and removable prosthetics. We’ve been doing this for over 50 years and during this time we’ve earned trust and respect of many dentists, dental surgeons, orthodontists and other dental industry professionals. With Thompson Suburban Dental Laboratory, you can always count on reliable, consistent work. Our goal is restoring your patient’s beautiful, natural-looking smile with the help of the best technology available today. Our highly trained, experienced technicians carefully select materials that will provide the strength and natural translucency needed to replicate or create each patient’s ideal smile. We provide our clients with superb innovations in the field, which is why we use CAD/CAM technology and KaVo articulators. 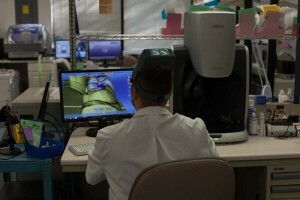 Our 10X microscopes reveal every detail of our prosthetics, so that problems rarely reach the chair. Have any questions or inquiries? Contact us today!